You are right in the middle of the Alps. The village Andermatt, at 1,450 m (4,760 ft), is nearly as high as Zermatt. But there are roads for us - that is why we are here! Enjoy the breathtaking scenery. Andermatt is not only famous because of a scene in the James Bond movie Goldfinger (1963) - it is most famous as a ski resort. Since 2009 a big tourism project is underway - with construction of a golf course, hotels and a big sports- and leisure-center. 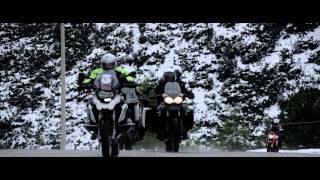 For us motorcyclists, Andermatt is the perfect base to explore the mountain passes. 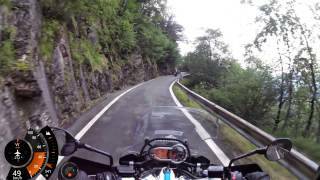 Susten-, Grimsel-, Nufenen-, Furka-, Oberalp- and St. Gotthard-Pass are just around the corner! Chamonix is France's mountaineering capital and is located at the foot of the famous 10,000 ft. Aiguille du Midi at a point where the glacial valley of the Arve widens out. The dome of Mont Blanc (The Great White Mountain) is visible from town. After Davos, Briançon (4,334 ft.) is the second highest town in Europe. Don't miss to visit Briançon's Citadel. From the terrace you've got the best view over the area. Since ancient times, two great routes into Italy have met here, and so the town always played an important commercial and military role. One of the most beautiful areas in Italy, and probably in Europe, are dominated by this lake. Lago Maggiore’s jagged banks are surrounded by the Lepontine Alps. The western bank is in Piedmont (the province of Novara and Province of Verbano-Cusio-Ossola) and the eastern in Lombardy (province of Varese), whereas the most northerly section extends 8 miles into the canton of Ticino, where it is the area's lowest point above sea-level as well as that of Switzerland. Planned in 1818, the pass road was built within 5 years (1820-1825) by about 2,000 workers. Because of the horse-drawn vehicles of the time, the gradient was limited to a maximum of 11%. At an altitude of 2,758m (9,048 ft), Passo del Stelvio is the highest pass in Italy and the second highest paved pass of the Alps. 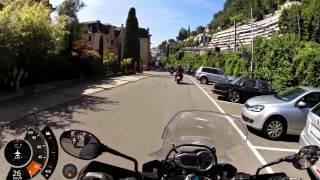 With its 48 switchbacks it is a tourist attraction famous all over Europe; a first class attraction for European bikers. You will love it, too! 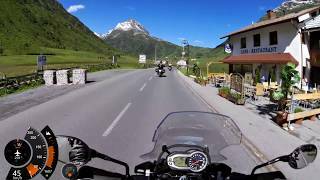 The Alps – every motorcyclist’s dream! This tour leads you through the Alps and will make you experience all its diversity. From Seefeld it takes only minutes to reach the first set of switchbacks, giving you an idea of what’s about to come. Awesome views cast a spell over us, as we tackle curve after curve, heading deeper and deeper into the Alps. In Switzerland the mountains are even higher and snow-covered year-round. On our way to France we collect passes like other people collect stamps. This is paradise for every experienced rider! And it’s not over yet. We enter Italy and immediately “La Dolce Vita” is all around us. Gorgeous lakes, lush orchards, the air filled with the smell of the world’s best Espresso – this must be the Holy Land. We tackle more passes until we reach the mother of them all: Stelvio. 87 switchbacks. Simply breath-taking! Before we return to Seefeld, the Dolomites and the Grossglockner high Alpine road mark two of the final highlights along our route. One thing is for sure: The impressions you gain on this two week tour will make you yearn for more! Accommodations: Comfortable middle-class hotels with alpine flair. 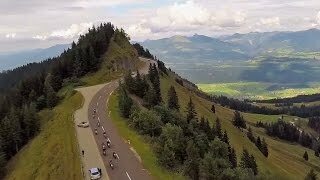 My participation in the Grand Alps tour has truly been a nice experience. I wanted to ride on an Edelweiss tour for a long time already and the best destination to choose for a first trip must be the Alps. That is why I decided to travel to Seefeld (Austria) and to start the Grand Alps Tour there. Getting to know people from Australia, Canada, Brazil and the USA was amazing and our group had a great time together. We all wanted to enjoy the landscapes, the roads, the food and the culture and our tour guides did a perfect job satisfying our needs. Riding across those gigantic mountains and going up and down so many times a day was just the best. In between all those passes the guides have chosen the right restaurants with delicious food. Every day offered us a magnificent surprise and every single mile we rode was just stunning. The Alps are great, the Dolomites are awesome and Italy, Switzerland, France and Austria towns are like fables. There don't exist the right words to express my feelings and the time I have had at the GRAND ALPS TOUR. 2,500 miles full of happiness. I really recommend it and will surely ride again with Edelweiss. 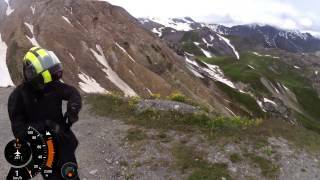 CGA 170A - Brad and friends on Classic Tour "Route Grandes Alpes"